It happens. A person leaves a comment and it leaves me thinking. It made me wonder, do I need to finish a book even though I don’t like a character, plot, setting, whatever? The majority of reviews on this blog are positive; I don’t come right out and say it anywhere or qualify it, but it’s true. The reason? I read these books on my own time, my personal time, time I’m NOT paid for. 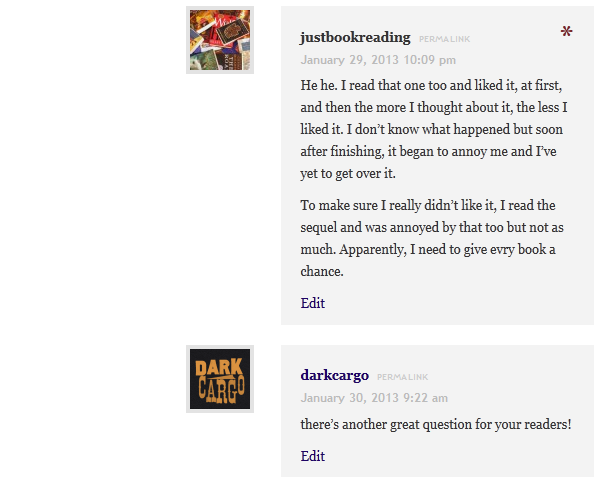 I like talking about books I read and enjoyed and that translates to what gets posted. When I stop reading a book, usually because I’m not enjoying it or it’s not working for me on some level, I usually (almost always) don’t talk about it. It might get a mention as a DNF but I tend not to talk about it because, not having read the book, I don’t feel I can comment on it in a meaningful way. In the rare occasions I do talk about a book I didn’t finish, it’s because I want to hear what others thought and sometimes that leads me to try the book again. Good or bad, that’s mostly what happens. So, what that means is that there are not many negative reviews here (a few do exist). But that doesn’t mean there are books I don’t like. There are. Loads of them. But when I come across one and I decide I can’t finish it, I just walk away. There are too many other books on my list, at the bookstore, and at the library that I can turn to for entertainment. Yes, there is the argument for negative reviews and the idea that reviews of the negative variety can be helpful to readers and even authors. I agree that when a person finishes a book and doesn’t like it, writing about it honestly provides a valuable service. In fact, we should all be doing this but that’s another post for another day. And, sometimes, I do feel it’s refreshing to not like a book. Not all books are good fits. So, where am I going with this? It’s okay to not like a book. It’s okay to stop reading a book. If you want, it’s okay to write a negative review of said book. Well, the comment may not have answered my question but it got me writing so I guess in a way it did bring me an answer, sort of. Thanks for the inspiration, Elizabeth. Myself, I totally appreciate professional negative reviews – reviews where someone outlines what didn’t work for them in the book (not the paid kind of review). When deciding about a book, I usually read a handful of reviews and I will read the 5 stars and the 1 stars. Some people love contemporary romance where the lady always needs rescuing – but that isn’t me, so hopefully that is noted in someone’s competent review. Negative reviews provide a service to readers as much as positive reviews, they simply take more effort to write in a clear, professional, respectful manner. It does take more effort to write a negative review and I sometimes wonder if that’s the reason I don’t see more of them. I’m always weary of a book when everyone loves it and look for other reviews that might give me a better idea of what the book is about. And I always appreciate when someone tells me they didn’t like a book and give reasons for it. I’ve occasionally had a “negative” review I wrote of a book spur another reader to go look for said book- the things I disliked about it were things that wouldn’t bother them at all, and i was able to describe it well enough that they wanted to read it. So I always write about the ones I didn’t finish, although I try to be kind even if I disliked the book. Good point and I’ve gone looking for books that others said they didn’t like. Not liking a book doesn’t mean that someone else won’t love it. interesting. 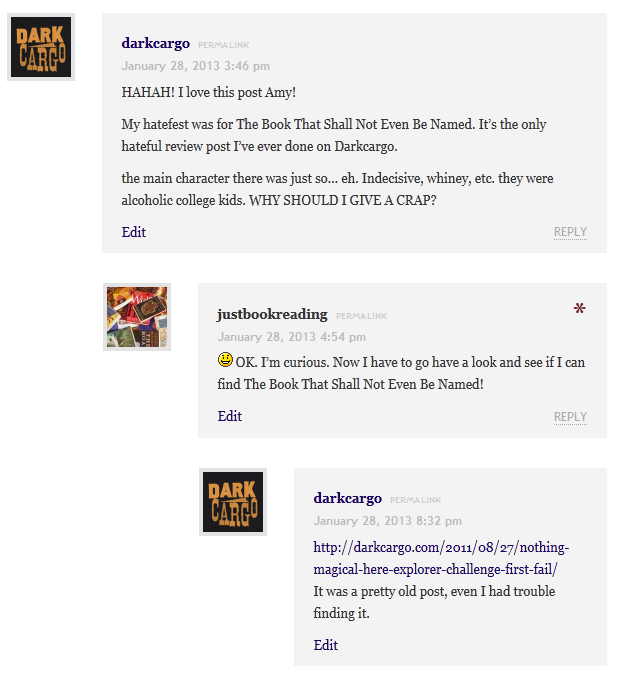 This is what I like about blogging, this discussion that happens here. nrlymrtl is really good at being able to craft a well-balanced review that also addresses the negative bits, and LittleRedReviewer is great, also, at just being able to say “it didn’t do it for me”. There is most definitely a place and a need for these reviews, and they take a lot of thought and effort. That’s something I can’t do, it’s not in my interest or skill set to pursue. Half the time I don’t know if I’m not interested in following through with a book because today I’m interested in butterflies rather than wool hats, so to speak, or if maybe I’m just too distracted or what. I find that for me, for my reading style, I am much more passionate about the books i love, and very “ennui” about the books I don’t. I used to believe that I needed to finish every book I started and what I ended up with was several books all half finished. When I finally just moved on it was better for me and the books. Now, I don’t have that kind of guilt. There are too many book and I only have so much time. I loan a lot of books out to people and always tell them what I thought. If I say it wasn’t for me but I think they’d really like it, they seem to be more interested and I always try to match people and books that way. That’s a good way to look at it and I’ve noticed myself doing that when a book isn’t working out. I need to do it more often though. Hahahaha, while I am in great sympathy with disliking The Magicians, I ended up liking parts of it quite a lot (others not at all! ), and I liked the sequel quite a bit. Overall, I try not to write negative reviews. They just aren’t as fun as positive ones. I’d much much rather be saying nice things about a book than nasty ones — I mean that I’d rather be sharing enthusiasm than anything else. That’s what book blogging is so good for! You can say “READ THIS OMG” and other bloggers, omg, will read it. I sometimes find it scary that people will go buy a book because I talked about how much I liked it. It’s probably the best part about blogging too.